Want an attention-grabbing RDA that’s sure to spark a conversation? 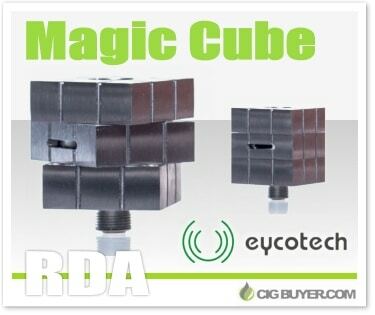 The Eycotech Magic Cube RDA looks just like the popular puzzle game from the 80s – the Rubiks Cube. This isn’t the first Rubiks cube-shaped RDA we’ve seen, but it’s the first one with adjustable airflow. Just twist the center piece to adjust the inlet, which has four magnetic stop points. It has a 3 post deck with juice well, milled negative posts and a double terminal post connected to a copper, adjustable 510 center pin. * Coupon valid for first-time customers only. Good while supplies last. Sigelei Spark 90W Mod – ONLY $34.90!